This is the feature film version of Julian Rosefeldt's art installation of the same name. I saw the installation back in January when it was at the Park Avenue Armory (My review is here). The films rocked my world. The feature film version takes the 13 films that all played simultaneously in the drill hall and cut them together as one film. Where the presentation in the drill hall allowed us to wander in and out of the 13 parts, the feature film controls our view. Several of them are intercut, words that were spoken in some sequences by the n screen Cate Blanchett are now heard in voice over. The approximately two and a quarter hour installation is cut to just over an hour and a half. The film does not have a narrative as such. The film is a series of vignettes that are strung together by the 14 Blanchette characters speaking the words of 50 artistic manifestos strung together. The effect is a commentary on manifestos and a creation of a new one. This is a giant head game that makes you think and feel and ponder. Some people are going to hate this others will be like me and be delighted. 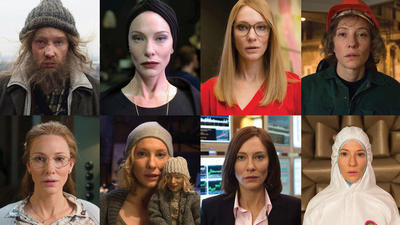 Yes this has a series of stellar Blanchett performances, which will be enough for some. For me I love the head games. I love how things are repurposed and rethought. I love how it forced me to think about what I was seeing and hearing. What I loved about the film was that it is a different experience than the installation. Where in the Armory people were afraid to laugh, the audience in the press screening filled the theater with laughter in all the right spots. Better yet the recutting of the shorts so they are intercut allows for the humor of some sequences to be intensified. For example the dinner prayer which kind of laid there in the installation brought gales of laughter each time it returned. I loved this and I can't wait to see it again. I have no idea. This is a one of a kind film with a great piece of acting at it's core. 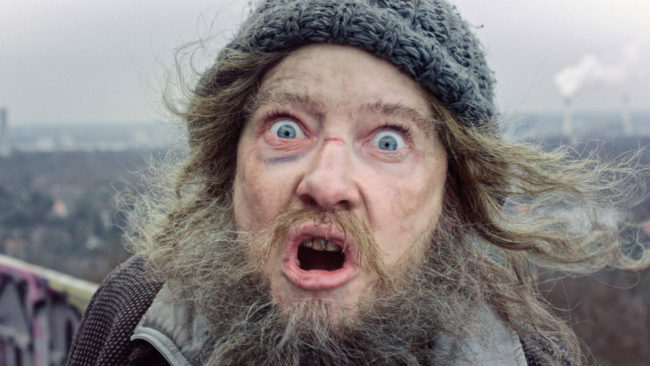 If the film weren't so quirky I'd say Blanchett is in the running for the Oscar. If you are adventurous or love heady stuff this is a must. If you aren't the choice is yours. Personally I highly recommend it to anyone who wants to try it.